Probably the most striking feature of Polasky’s latest monography on the revolutionary era is it’s organization. The Polish-British professor at Harvard chose not to structure her otherwise narrative-style book chronologically, as one might expect, but instead uses the source material itself as the main scaffolding. Each chapter of her book revolves around a single type of source, for instance journals, letters, rumors, decrees and pamphlets. This approach is well chosen since the subject matter of Revolutions without Borders is the spread of revolutionary ideas in the Atlantic Realm of the late Eighteenth Century. By making the sources themselves the organizing principle of the book, she allows the ideas contained within the novels, newspapers, and decrees she describes to take center stage. Polasky is not alone in her attempts to explore the spread of revolutions across the borders of the early modern states on both sides of the Atlantic. In the early 1960s, Robert Palmer endeavored to map the chain of revolutions across the Atlantic from 1776 to the early nineteenth century and at that time proved the importance of revolutionary ideas for that process. Many followed suit as one can also judge by the extensive historiography on the subject Polasky exhibits. But as Polasky explains, most of these focus on the relationship between the American and French Revolutions, although with the advent of postcolonial history, the Caribbean and South America have received more scholarly attention, as some of the titles on her list show. Through her examination of source material from the United States to Poland and The Netherlands to Saint Domingue, Polasky truly captures the vast spread of revolutionary ideas in cosmopolitan society throughout the Atlantic world. Polasky’s novel approach effortlessly blurs the distinctions between groups of historical actors. Men and women, slaves and free born people of color, aristocrats and low born; all are shown to be important conduits of revolutionary ideas. For instance, the revolutionary potential of women writers and their novels is explained by the way they rendered ‘the domestic political,’ as Polasky aptly puts it. She unveils the astounding similarities between women writers from different countries and cultural backgrounds, and by integrating the discrepancies between their novels and their real-life experiences, renders them all the more human. The tale of the freed slaves who were towed from the Caribbean to Nova Scotia and onwards to the west coast of Africa conveys the vast distances to be crossed, not only geographically, but also between different racial backgrounds. Polasky manages to make history come alive, especially in those cases where disaster struck. The story of eighty-five delegates from the colored people of Saint-Domingue traveling for weeks to France just to be refused a plea in the National Assembly, for example; or the heart-rending experiences of Anna Falconbridge in the budding settler community in Sierre Leone, where hundreds of freed slaves from the Caribbean died due to fever after having been relocated from Nova Scotia; or the Prussian-born Dutchman Anacharsis Cloots, who was guillotined during the terror, while his cellmate Thomas Paine escaped the same fate. These stories lend the struggles of the revolutionary travelers immediacy and potency and demand our posthumous respect for their efforts. Despite its gripping vitality, Revolutions without borders is not flawless. By solely focusing on the contents of the source material, Polasky omits information vital for readers to properly evaluate the scopte of the revolutionary movement. Simply put, the book lacks factual information. How many pamphlets were written; how many people read them? How extensive were the networks of correspondents; what were the print runs of newspapers and their readership abroad? What was the actual effect of government decrees? Sometimes Polasky does inform the reader somewhat on the workings of a given medium for instance, she mentions the notoriously unreliable early modern international postal system. But even there, we lack factual information on quantity and speed. This is especially problematic in Polasky’s chapter on rumors. Polasky’s daring attempt to show the potency of rumor in the Caribbean for the slave revolts, especially on current day Haïti, falls short. Even though extensive literature on creole languages and cultural appropriation and diffusion is available —which might have been a means to explore the functioning and spread of rumors in the slave societies — the reader is mostly treated to a chronological narrative of the Saint Domingue slave revolt largely told from a French perspective. Of course, tracing historical rumor is very hard to do, but reading ‘between the lines’ and ‘against the grain’, is about the only methodology Polasky seems to have to offer and that is hardly convincing. She references overheard conversations among slaves and clearly shows the fear exuding from Colonist reports and press, but the actual spread of the rumors is neither mapped, nor explored, nor explained. Basically, what Polasky has shown is that there were many revolutionary people who, either by traveling themselves or by partaking in international networks of revolutionary minded people, spread revolutionary ideas. That is not to say that Polasky’s central argument runs hollow: the enemy of a universal, borderless world wherein all humans are equal is nationalism. This makes her book a dire warning in these times of revitalizing nationalism and rising populism currently threatening the fabric of the tender international relations within Europe, but also across the Atlantic. In that respect, her monography is in a sense comparable to Mike Rapport’s earlier treatise on the revolutions of 1848. But for all that, upon reading Revolutions without borders, we are still in the dark with regard to whether truly universal human rights and freedom were ever within reach during the revolutionary era. To what extent the revolution was made, caused, or affected by the sources Polasky has so succinctly described is something we have yet to discover. 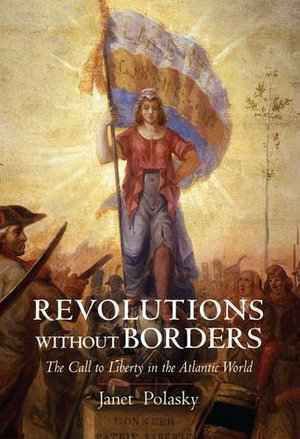 For instance: Wim Klooster, Revolutions in the Atlantic World. A Comparative History, New York 2009. Erik Jacobs: Rezension zu: Polasky, Janet: Revolutions Without Borders. The Call to Liberty in the Atlantic World. New Haven 2015 , in: Connections. A Journal for Historians and Area Specialists, 02.02.2019, <www.connections.clio-online.net/publicationreview/id/rezbuecher-25676>.